Prepare the dough by combining 2 packets of Pizza crust mix and one cup of very warm water in a large mixing bowl, stir vigorously for about 1 minute and cover bowl with plastic wrap, place in a warm location and allow it to rise for about 7-10 minutes. Chop the remaining dough reducing the larger chunks and place into a medium mixing bowl. Rough chop the package of pepperoni adding it to Dough then adding 1 cup of the sauce, 2/3rds of the cheese and herbs. Mixing with wooden spoon tell the sauce has covered well. 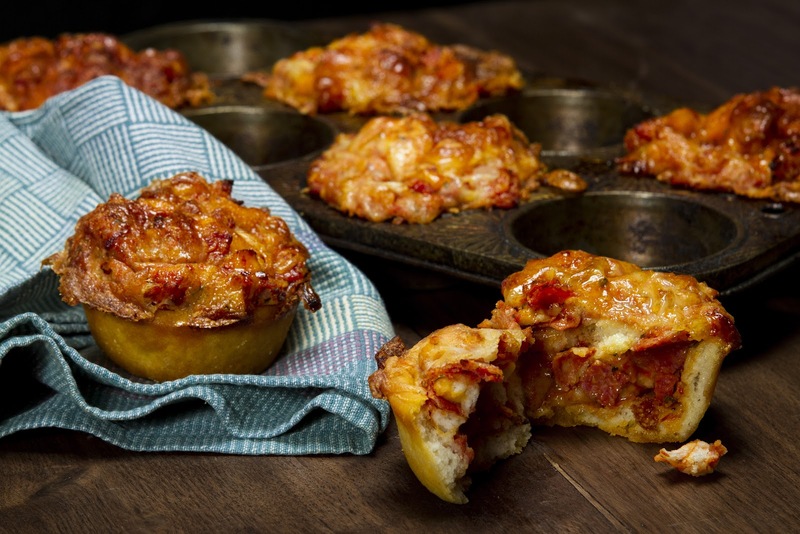 Place the 3 ½ ” mini crust into the oiled muffin pan. Divide the dough mixture evenly and top with remaining cheese brushing with the remainder of Olive oil. 350 oven for 25 min.